Sister Winifred Reddington, CSJ, 85, died Tuesday, March 14, 2017, in Villa St. Joseph in Baden in her 68th year as a Sister of St. Joseph. The daughter of William and Winifred Holian Reddington, Sister Winifred entered the Congregation from St. James Parish in Sewickley, PA.
For more than 20 years, Sister served as a teacher in the Pittsburgh and Greensburg dioceses including St. Bernard, Indiana, PA (1955-59), St. Bernadette, Monroeville (1964-68), and St. Catherine, Pittsburgh (1968-71). Sister Winifred then moved into parish work, serving as Social Service Minister at Nativity, North Side (1974-82) and St. Veronica, Ambridge (1983-85). In what was regarded as a pioneering step in Allegheny County, Sister Winifred was among the first women religious to be hired as a legal guardian in the public sector. 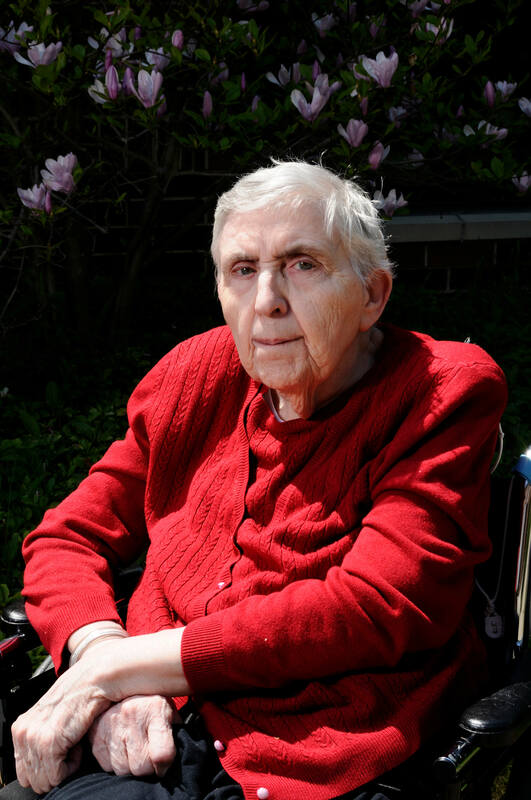 From 1985 to 2001, Sister Winifred served as a legal guardian at the non-profit Ursuline Center, where she administered the financial, legal and personal affairs of the frail elderly who had declining mental or physical capacities. In her often demanding role, Sister Winifred approached her work as a “ministry of presence, and treated each client as sacred in the midst of the daily hurricanes,” wrote one of her early supervisors. Four years into her work as a guardian, Sister Winifred completed a thesis project on “Advocacy as Ministry to Severely Disabled Elderly” to fulfill requirements for a M.A. in Pastoral Ministry in the Corpus Program at Seattle University. Her 1989 project was hailed as a model that could be adapted from the public sector to faith communities. It was her vision that the Church would take an active role in addressing the needs of the elderly through outreach and advocacy. She fully embraced guardianship as a ministry that advocates for the justice and dignity of the elderly. Known for her compassionate and gentle spirit, Sister Winifred wrote that she discovered the rewards of her ministry in daily interactions: “holding a frightened person’s hand . . . hugging the elderly woman who is crying because she feels abandoned . . . trying to understand their confused speech and reassure them.” She found inspiration in Matthew 25: “Whatever you did for the least of my sisters and brothers, you did for me.” Sister Winifred, who maintained a wonderful sense of humor through the years, retired to the Motherhouse in 2001, and, four years later, became a resident of Villa St. Joseph. Sister Winifred is survived by one brother, William (Norma) of Yorba Linda, CA, nieces and nephews, and the Associates and the Sisters of St. Joseph of Baden. Friends will be received Wednesday, March 15, from 1 to 8 p.m. and Thursday, March 16, from 11 a.m. to 3:30 p.m. at the Motherhouse of the Sisters of St. Joseph. Prayer Vigil will be Wednesday, March 15, at 6 p.m. at the Motherhouse. Mass of Christian Burial will be offered Thursday, March 16, at 4 p.m. Burial will follow in the Sisters’ Cemetery on the Motherhouse grounds. Donations in the name of Sister Winifred may be sent to the Sisters of St. Joseph Memorial Fund, Development Office, 1020 State St., Baden, PA 15005. Make a gift in memory of Sister Winifred.